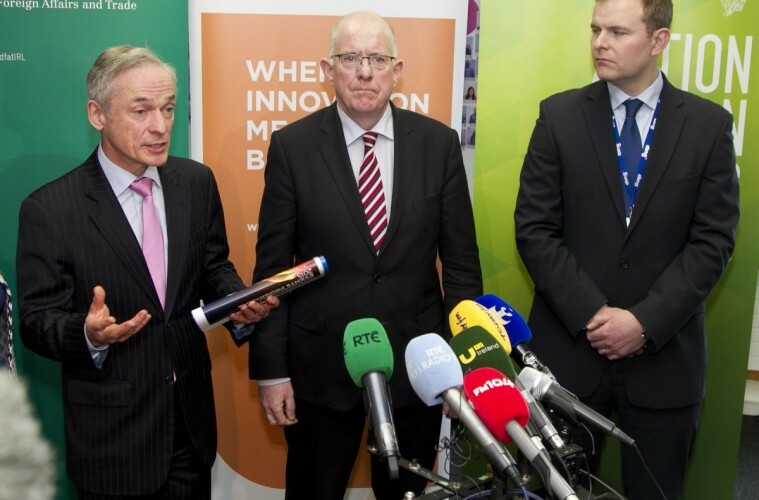 The Minister for Jobs, Enterprise and Innovation, Richard Bruton TD and the Minister for Foreign Affairs and Trade, Charlie Flanagan TD, launched the 2015 programme of events targeting trade and investment for Ireland. Enterprise Ireland’s programme of trade missions and international activity for 2015, will see a total of 121 international trade missions and events to support Irish companies selling abroad, up from 118 in 2014. 2014 exports by Irish companies supported by Enterprise Ireland significantly exceeded previous records and supported 8,500 extra jobs in Ireland. The announcement took place at the headquarters of ding*, the world’s largest top-up provider and an innovative Irish company which has benefited from trade missions and Enterprise Ireland support in the past. “At the heart of the Action Plan for Jobs is our drive to increase Ireland’s exports and create more jobs in exporting companies here. Over the past 4 years, exporting companies have increased their employment by nearly 40,000, with massive knock-on impact across the country. The challeng is to broaden and deepen that impact, and that is why we are increasing our programme of supports for our exporting companies. “In 2014, exports by Irish companies supported by Enterprise Ireland saw a major increase over previous records, supporting an extra 8,500 extra jobs in Ireland. By putting together a programme of international activities for 2015 that is more ambitious and more intensive again, I am convinced that we can support more exports and more jobs in Irish companies right around the country this year. This jobs growth is what will ultimately enable us to grow tax revenues and ultimately deliver income tax cuts and improved services, improving people’s lives”. “Exports create and sustain jobs in Ireland. 2014 was a record year for new job creation by Enterprise Ireland companies. Our focus in 2015 is firmly on building on this success by helping clients grow their export sales. Central to Enterprise Ireland’s strategy are Ministerial-led trade missions and international events which are invaluable in opening doors and making high-level introductions for our clients, enabling them exploit the opportunities that exist in global markets.